It’s back-to-school time and high schools, universities and schools of higher learning across the nation will be starting their fall semesters this year in the forthcoming days and weeks to come. This week’s Watch Collection Essentials will focus on the perfect back-to-school watch styles for both him and her. 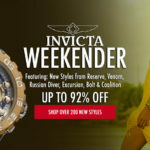 Our Back To School Event, currently taking place at WorldofWatches.com features over 100 popular back-to-school styles for elementary, high school and college students from many popular watchmakers, including Swiss Legend, Invicta, ESQ Movado, Ben & Sons, Lucien Piccard, TechnoMarine, Caravelle NY, Puma, Red Line, Elini Barokas, Braun, Ritmo Mundo and more. What’s more, you’ll receive a free Swiss Legend Back Pack with your purchase of any watch featured in the sale. 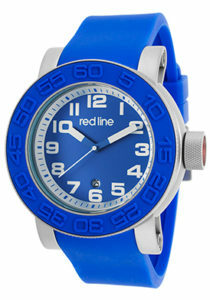 The Red Line Xlerator men’s watch has a youthful and colorful vibe, ideal for students of all ages. The 52mm diameter, 16mm thick case in brushed and polished stainless steel is presented on a bright cobalt blue silicone strap. A cobalt blue silicone ring with raised markers highlights the unidirectional rotating bezel. The matching cobalt blue dial shines with white baton hands and white Arabic numeral hour markers. A window at the 6 o’clock hour reveals the automatic date calendar. Features include a locking screw-down crown and case back for water-resistance to 100 meters or 330 feet along with quality quartz movement inside for precise time-keeping accuracy. 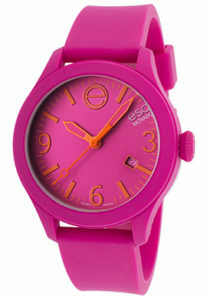 The ESQ Movado One Swiss-made women’s watch is an equally eye-catching feminine model in cheerful magenta. The bright magenta silicone covered stainless steel case is presented on a matching, magenta colored silicone strap. The monochromatic look is furthered with a matching magenta bezel and dial. The latter has bright orange colored skeleton hands, baton and Arabic numeral hour markers. 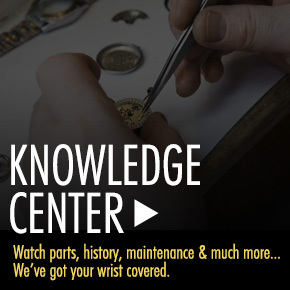 Features include quality Swiss-made quartz movement inside, along with a locking screw-down crown and case back for water-resistance to 100 meters or 330 feet. ESQ One women’s watch is 43mm in diameter and 12mm thick. 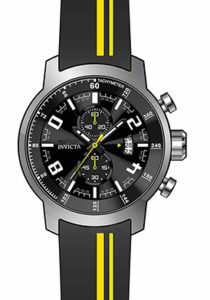 The Invicta S1 Rally Chronograph is sleek, racy and an excellent back-to-school watch choice. This high-speed men’s watch features the 51mm diameter, 14mm thick case in brushed and polished stainless steel, presented on an attractive black polyurethane strap with bright yellow feature stripes. The integrated stationary bezel encircles the metallic black dial with a tachymeter outer dial, two sub-dials, luminous hands, luminous baton and Arabic numeral hour markers. Features include an automatic date calendar, small-second and 60-minute registers. A scratch resistant Flame Fusion crystal covers the dial. Additional features include quality quartz movement inside for precise time-keeping accuracy and water-resistance to 100 meters or 330 feet. 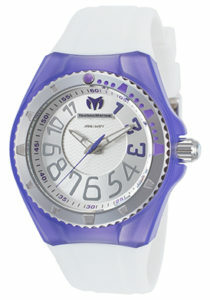 The TechnoMarine Cruise Original watch is an excellent back-to-school watch choice for her. This feminine and appealing women’s watch features the round, contoured stainless steel case with a purple silicone case cover, presented on a white silicone strap. The unidirectional rotating stainless steel bezel surrounds the silver colored dial with luminous hands and highly stylized raised Arabic numeral hour markers. Features include a locking screw-down crown and case back for water-resistance to 200 meters or 660 feet and precise quartz movement inside. TechnoMarine women’s watch is 40mm in diameter and 12mm thick. 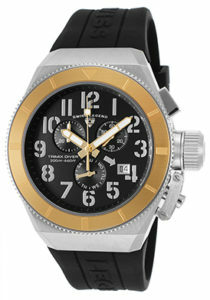 The Swiss Legend Trimix Diver 2.0 men’s chronograph is modern, urbane and ideal for college and post-graduate students. This outstanding men’s watch features the handsome Tonneau shaped case in brushed and polished stainless steel, presented on a high-performance black silicone strap. The stationary bezel in yellow gold-tone stainless steel encircles the legible black dial with three sub-dials, luminous hands and raised Arabic numeral hour markers. Features include an automatic date calendar, along with small-second, 30-minute and day-of-the-week registers. 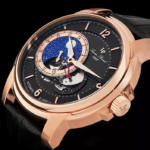 Additional features include a scratch resistant sapphire crystal above the dial, premium Swiss-made quartz movement inside along with a locking screw-down crown and case back for water-resistance to 200 meters or 660 feet. Swiss Legend Trimix Diver men’s chronograph is 43mm wide and 14mm thick. 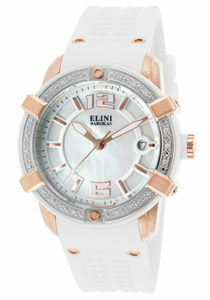 Glowing with radiance and sophistication, the Elini Barokas Spirit women’s watch is a splendid selection for college age students. This ultra-chic and feminine timepiece features the 39mm diameter case in rose gold-tone stainless steel, highly polished to a mirror-bright glow. The case is presented on a stylish white silicone strap with a deployment clasp for added security and convenience. Shimmering round-cut diamonds dramatically adorn the lustrous diamond-cut bezel in polished stainless steel with rose gold-tone accent bars. The iridescent Mother-of-Pearl dial shines with luminous rose gold-tone outlined hand, Arabic numeral and baton hour markers. Features include a scratch resistant Sapphitek crystal above the dial, water-resistance to 100 meters or 330 feet and premium Swiss-made quartz movement inside for precise time-keeping accuracy. 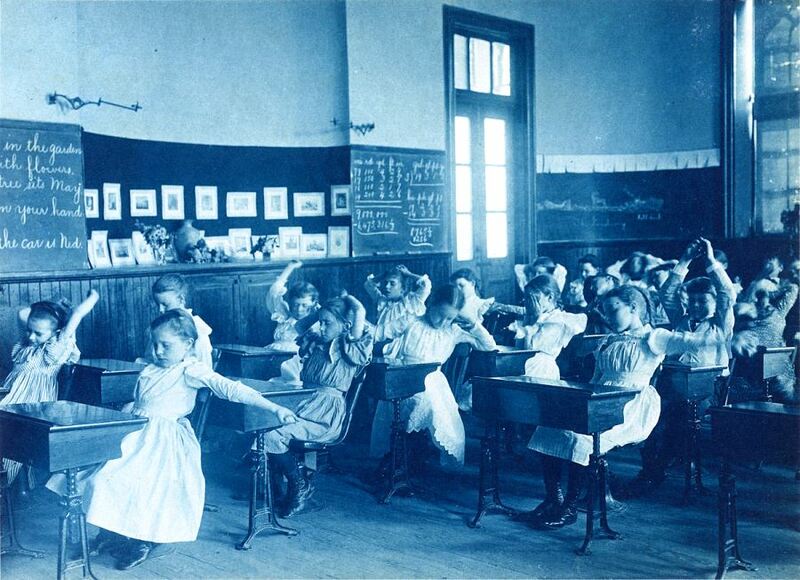 Francis Benjamin Johnston vintage classroom courtesy of Wiki Commons.